Dominated by unorganised players, Indian toy industry is now attracting many global players. The Indian toy industry, which stands at Rs 7,500 crore at present, is expected to touch Rs 13,000 crore by 2015. The growing industry coupled with increasing population and rising disposable incomes have made the country a favourite destination for global retailers. 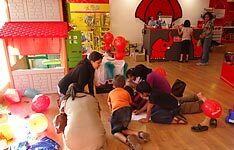 UK-based Hamleys, which forayed into the Indian market in 2010, plans to add 20 stores in the next three years. Germany's Simba Dickie Group, which entered India in 2009, intends to open 50 stores by the year end. “We have already seen robust growth over the past two years. With are forth coming expansion plan we intend to become India’s number one toy company,” says Ben Nabert, Simba Toys’ CEO for India, West Asia and North Africa. The industry is witnessing a sea- change wherein remote controlled and edutainment toys have replaced soft toys. Talking about the latest trend, Bijou Kurien, President and CEO, Reliance Retail, says that boys are now fond of having radio-operated toys and girls are more interested in activity-oriented toys than the traditional stuffed toys. He states that the current per capita consumption of toys in India is very low vis-à-vis USA and China. “There is a clear trend towards educational toys, so parents not only require a play value but also an educational value. This aspect is more in focus in the Indian market compared to the European market or even the Middle East market where people just buy toys to keep the kids satisfied,” states Nabert. The retailers are offerings a wide range of products that can really serve every type of customer across all price points with very good quality.